Given the scale of the tap takeovers they've been embarking upon – 32 beers at Forester's; 33 in the forthcoming event at Keg & Brew – there's been much in the way of new beer coming out of WA's Feral. Indeed, there are four new, draught-only beers available now at said takeovers and wherever else they're requested. And, being Feral, they're all rather different. 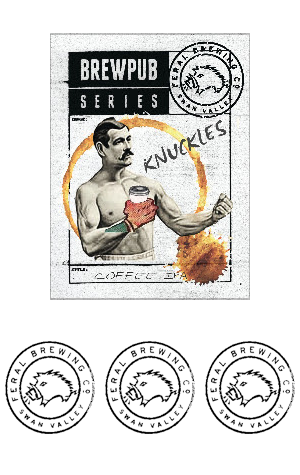 Knuckles is a collaboration with Freo coffee roasters Darkstar: an American style pale ale infused with their beans. We're told the coffee from Mormora plantation in the Guji zone of Sidamo (which presumably means something to someone) is dry processed: the ripe cherries are fermented in the sun and then the pulp is removed from the seed without the use of water, creating berry-fruit flavours. These beans are then combined with the aromatics of Citra and Centennial hops. Also boasting coffee characters, if not coffee from the Guji zone, is Milky Johnson, a milk porter in which "the addition of nitrogen makes [it] smoother than its name" while lactose (milk sugar) creates "a silky yet creamy mouthfeel" to accompany aromas of "liquorice and mocha". Continuing along the furrow initially ploughed by their German IPA Hopfen Fahrt comes Houblon Voyage. This is a French IPA that makes use of new French hop variety Barbe Rouge. According to the Feral peeps, it's a cracker: "This beer is a showcase of the hop variety bursting with a fresh pineapple and bubblegum aroma, finishing off with an assertive bitterness and grassy resinous mouth feel." Completing the foursome is The Jackal, the latest sour release from the brewery. This one is tagged an "Australian Sour Ale" and sees local hop Galaxy used lightly to add an aroma of tropical fruit to a sour ale. "Starting dry and tart with a slight hint of hop resin and a light passionfruit finish" is what they're telling us.